I'll leave it to you to decide what's what. A few month ago i swapped an ASUS 780ti for the RX580 to take advantage of freesync but now i wonder how that card would've performed with the 2600.. It was faster than the 580 even with only 3GB of Vram. It was interesting to compare Nvidia and AMD's graphics solution though. AMD have a higher render quality but Nvidia get better performance. Nvidia looks dramatically different lowering the graphics settings but the AMD still looked good on low/med.. All depends on what you view as important i suppose. It's always good to be skeptical, but the forum skews neon Green tbh. Worth keeping in mind that games lean towards one or the other of the vendors, in this case SotTR is very much Nvidia-favoured (supposed to be RTX title after all). You can see OC vs OC 1080 vs V64 duke it out on older drivers, it's very close. Hmm, not sure I noticed a difference in image quality when I went from Radeon HD 7770s in Crossfire to a GeForce GTX 970, or any other time I've switched between team red and team green. I've got to admit I'm curious how the 970 would've done with Ryzen - there were warning signs back in the old days of people saying the FX series (like I had at the time) bottlenecked the 970, but I assumed they meant at 1080p only. Turned out I was wrong even at 3440x1440 in most recent games. Yes that's true. I recall the original Tomb Raider reboot being AMD optimised, so it didn't quite dawn on me how Tomb Raider changed to favouring nVidia in the sequels. Not sure how team-green skewed this forum can be though. Nearly every GPU upgrade suggestion is an RX 570/580/590, Vega 56, or Vega 64. The main outlier is the GTX 1080 Ti (if you can get one). I did only join in October 2018, so perhaps things were different not so long ago. Time to adjust my sapphire pulse vega 56. Anyone got any screenshots/guides for wattman and what I should be doing? I just want to get the thing running cooler and quieter with a bit more performance with a bit of undervolting I believe? YouTube has a Wattman V56 Global Graphics game setup guides and undervolting. People find it hard to recommend the current crop of nVidia cards, since they are somewhat overpriced, particularly at the high end. There is forum bias towards nVidia, though I wouldn't describe it as overwhelming. If AMD get their act together, it'll balance out a lot more. Not sure how team-green skewed this forum can be though. Peeps should just ignore the AMD/Nvidia accusations and move on. Even some new guys on here are making toxic "fan" remarks with no basis. Moving on... I love seeing these high clock videos with Vega. Shows how it should have performed if it had gone amds way. My very first card was a voodoo 3dfx before nvidia were on the scene, then ati cards before AMD took them over. I have alternated between them over the years based on what I can afford at the time with whatever performance I can get. I have no idea why brand loyalty exists its not like you get credits to spend on more stuff but they all have cycles where the product shines more than the others. I have noticed strange bias on many a forum, this would be no different. But its 2019 and they have been rivals since what 2000? My Sapphire 56 Pulse arrived yesterday, really pleased with it so far. I've been playing around a little with Wattman settings, trying to follow some advice from this forum. this is after running the Tomb Raider demo on ultra for 15 mins, card sitting at its capacity (~1605MHz) and memory @ 950MHz. I remain unsure about my fan settings. I currently have it set to automatic, as I really want the 0RPM at idle setting to be enabled. This option is no longer available in manual mode, as the minimum setting is 30%. My state 5, 6, 7 voltages are 1050, 1070, 1090, although in testing the card almost never breaches 1.050v. I just went with using the auto undervolt feature for my pulse vega 56, seems to work well so far. 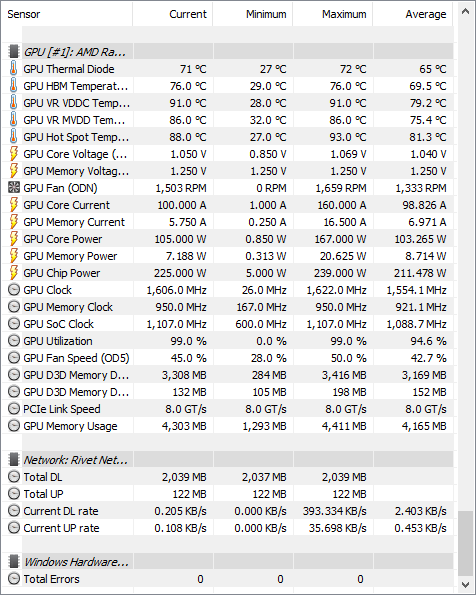 GPU is running about 5 degrees less. Interesting? Also sounds convenient. Keep me informed as I'm looking for advice/guides on undervolt and OC my Red Dragon 56. Mr G have a look at this video. Thanks for that, bookmarked for the weekend. No worries, I have the same card as you and seems to work fine. So I bought a gigabyte Vega 56 during black Friday and ended up returning it, but was just to loud. Looking at the Vega 56 again as Nvidia prices are too high. Which is the quietest 56 currently?